Well it looks like I have some serious eating to do on Sunday as a judge for the Bedford Blues and BBQ cookoff. I like a challenge! I believe a fast on Saturday is in order. :) There were only 19 teams last year, this year there are 53! I just heard the music line-up for the Texas Monthly BBQ fest in October. Jimmie Vaughan is one of the acts so I am a very, very happy camper. The event is completely sold out, more than 2 months in advance. I am looking forward to having some Snows BBQ without having to get up at 7 am!! The great burnt ends experiment! Brisket was on sale cheap again this week ($1.49/lb) so I decided to experiment a bit. 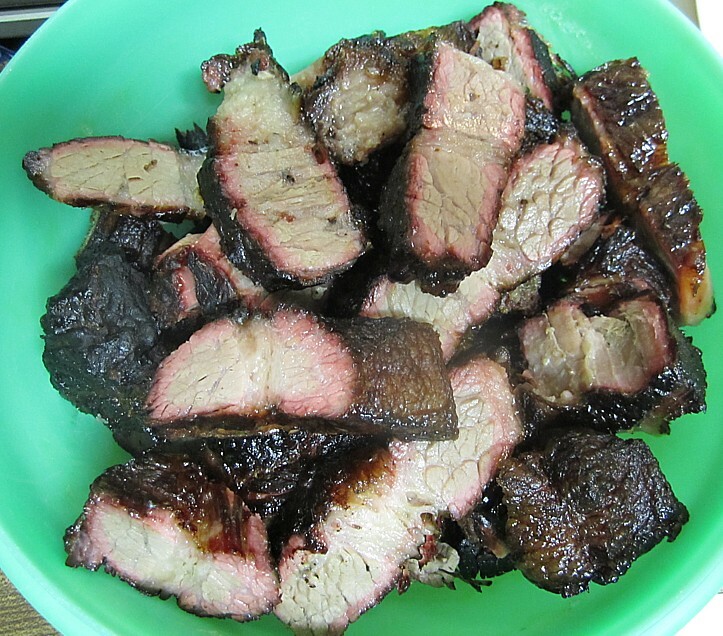 My favorite part of most brisket is the burnt ends. 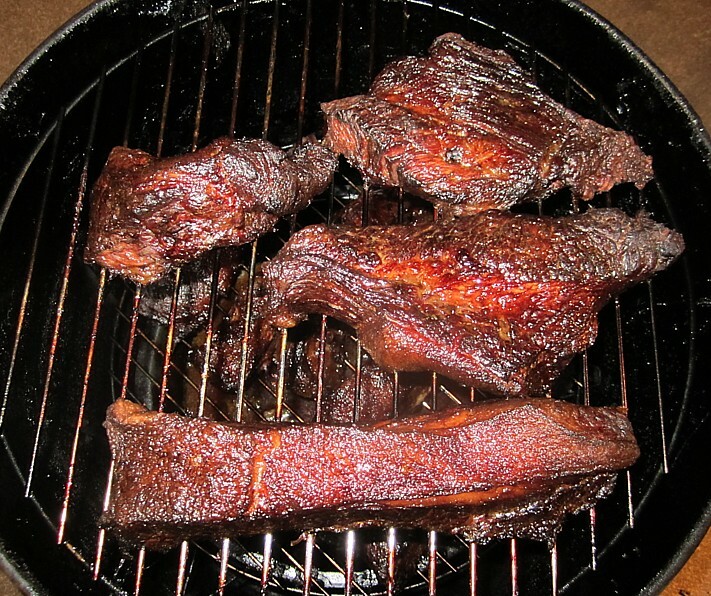 That's the part with plenty of bark, some crispy fat, and always the most delicious smoke flavor. As we only use a little bullet smoker, we have always had to cut briskets in half to make them fit. 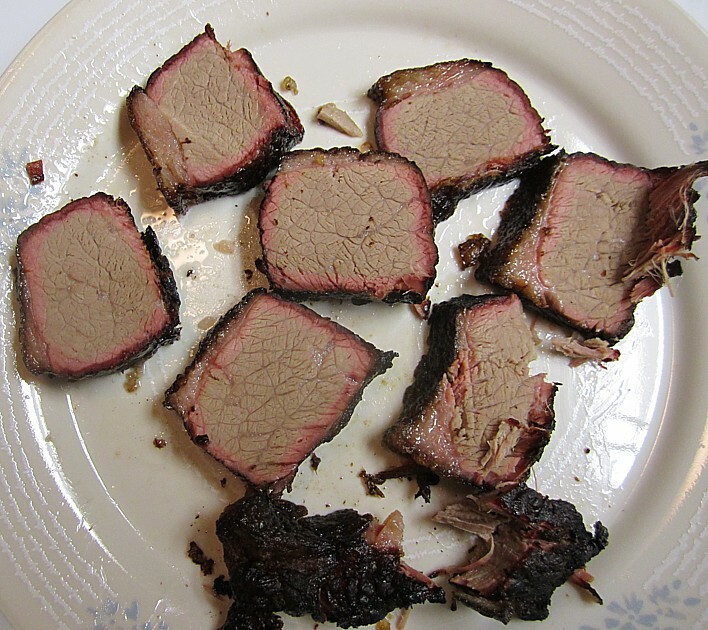 I started wondering, what would happen if you actually cut the brisket up into little brisket "steaks", then go through the same smoking process? 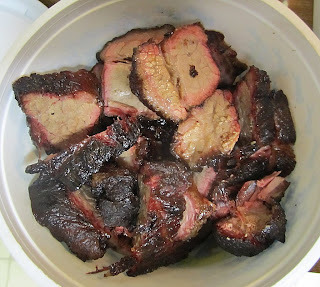 The reasoning went, more exposed surface area, more burnt ends, more good eatin'! I figured the main risk was it would come out too dry. However there was an added bonus that it should cut down the cooking time A LOT! I started out with a 14 pound brisket and cut it up into 11 portions, trying to keep them about equal weight of a little over a pound. The fatty end slabs had to be a little thinner because the brisket is thicker there. 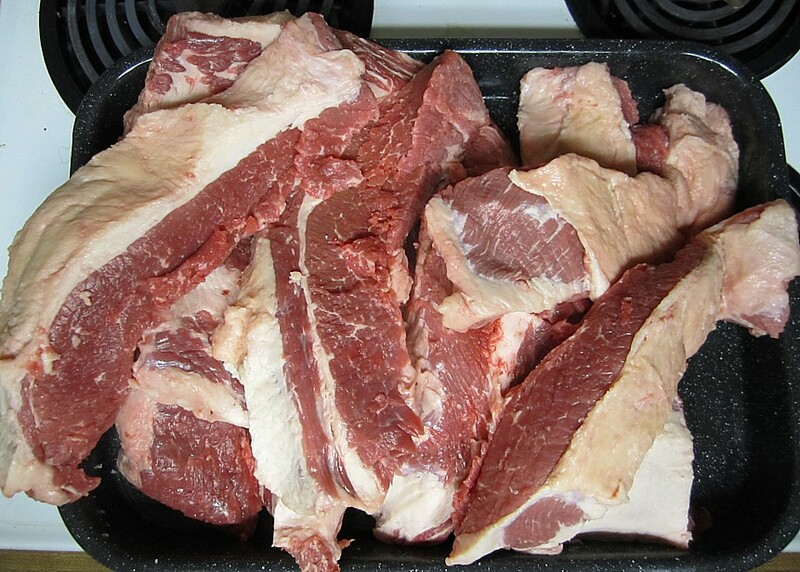 As always, I arranged the brisket fat side up, where possible. Most of the lean end went on the bottom rack, the fatty end went on the top rack. 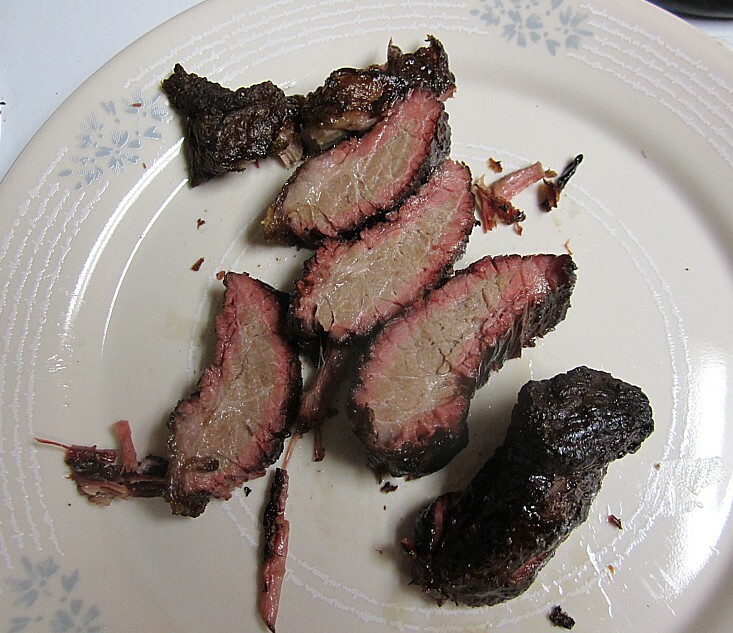 After about a 2 hour smoke (using the usual go-by of 1-1 1/2 hours per pound on brisket "steaks" that were a little over 1 pound) I opened the lid and grabbed a piece to sample. It was cooked, but still very tough, so after a couple of sample bites, back it went on the top rack. Based on my sample at 2 hours, I was torn on whether to continue on the smoker, or pull some slices, wrap them, and finish in the oven. 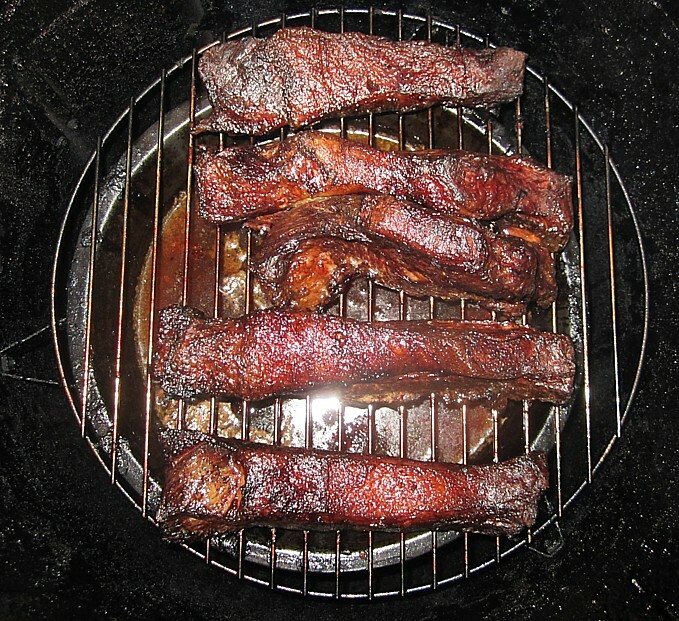 I decided to just let things run for another 4 hours, re-stoking the coals and adding wet pecan wood every hour or so. After a full 6 hour smoke this is what I found on the top and bottom racks. A quick sample piece confirmed good tenderness and smoke flavor, as well as a pretty nice smoke ring. After that sample I pulled all the meat and let it rest for about an hour before cutting it up. Well, except for one piece that I ate! As I feared, the lean end of the brisket was a bit dry, but the fatty end was very juicy and flavorful. 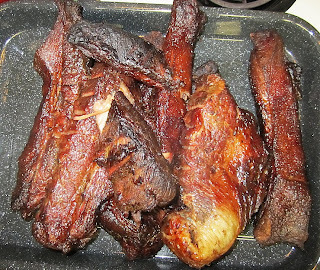 As usual, there was not as much smoke flavor as my wife seems to get, despite my adding lots of pecan every hour. She just has the magic touch. I don't. The fatty stuff was perfectly tender but the lean could be a bit chewy at times. 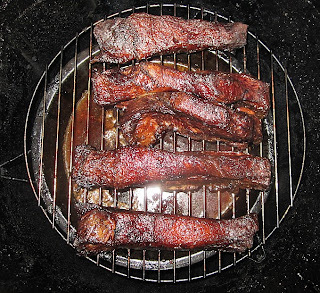 However the chewy bits usually had the best smoke flavor, a nice bark, and crispy fat bits. 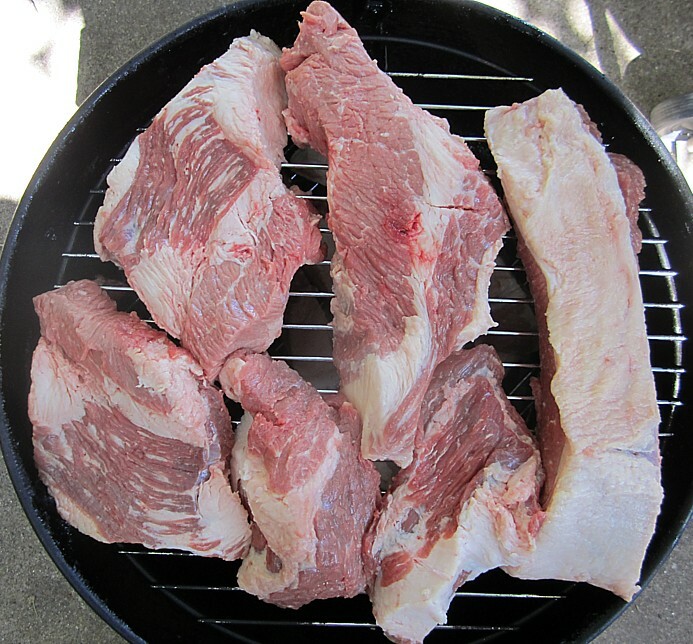 By cutting the brisket into elongated "steaks", it meant the slices were weird little square bits. However every little bite had a bit of bark or crispy fat attached to it, all the way around. 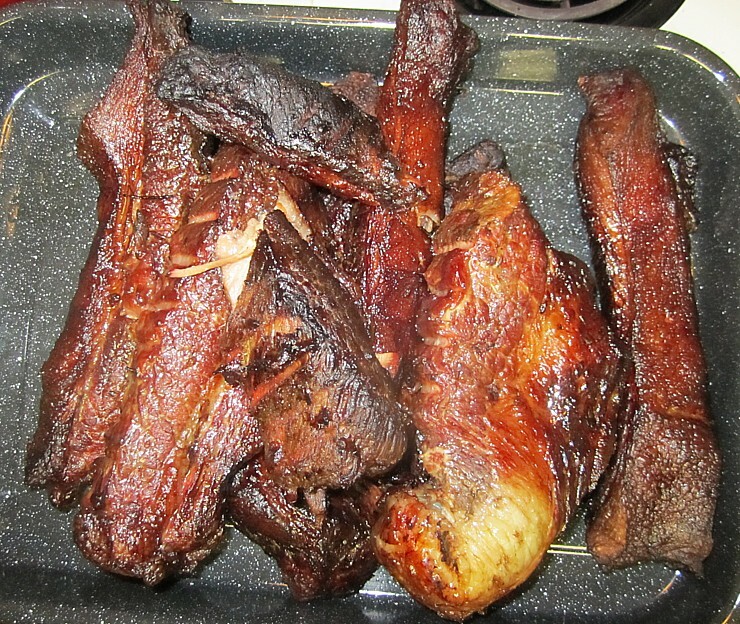 After carving everything up, I have quite a bit of smoked meat to enjoy over the next week or so. I hate to say it, but some of it may need sauce. However some of it won't! I think if I try this again there are several variations to the experiment I'd like to try. 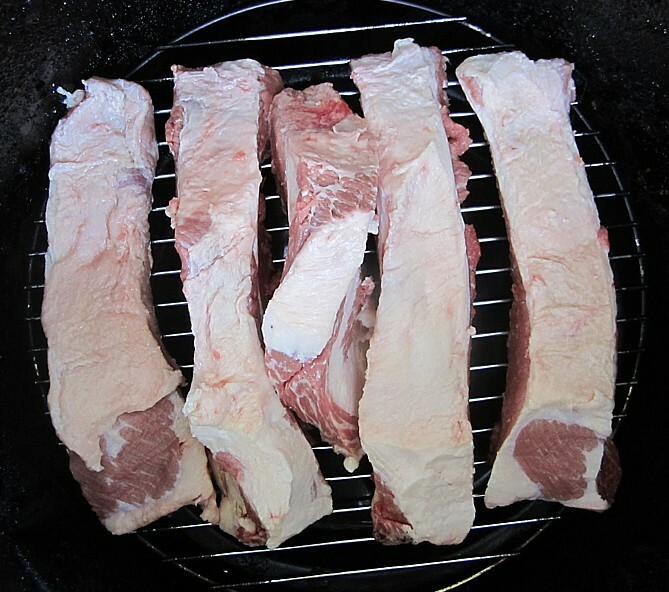 First, smoke it extra heavy for 3 hours, pull all the meat, wrap in foil and finish in the oven. Second, pull the lean brisket half way through, wrap and finish in the oven and leave the fatty brisket on the smoker. Just to see if there is a difference in smoke taste. 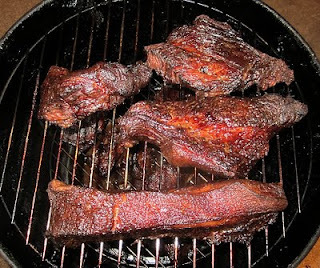 Third, cut into fewer pieces, maybe 4-6 brisket "steaks", then smoke and oven as usual. I will say this technique does cut down the cooking time substantially. 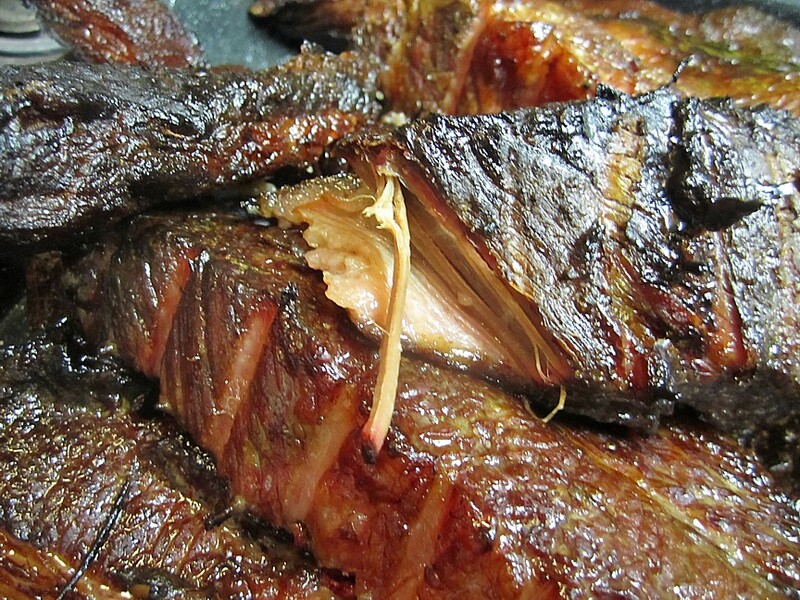 A 14 pound brisket cooked in the usual way would probably be 20 hours combined cooking time to finish properly. I got some pretty good meat in just 6 hours by chopping it up.